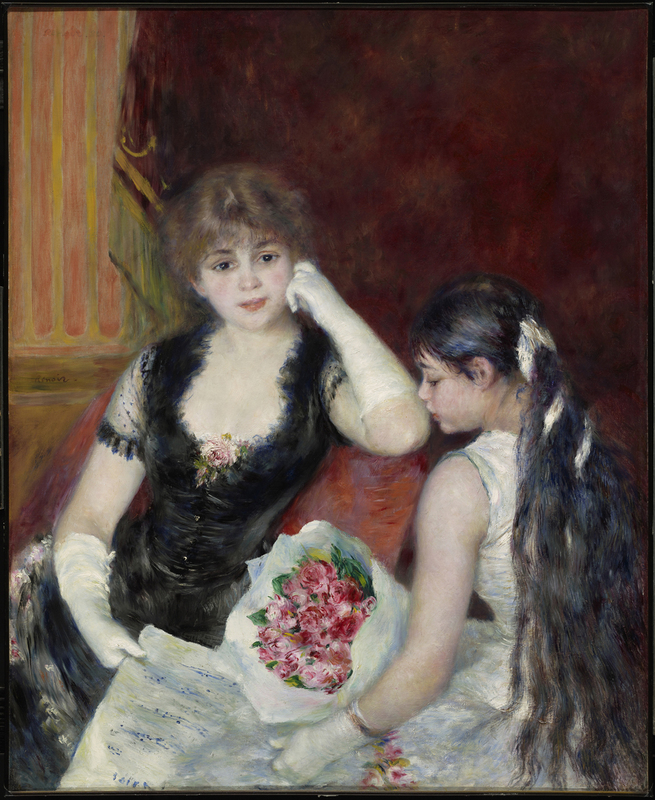 Pierre-Auguste Renoir’s “At the Concert a Box at the Opera” (1880). Oil on canvas. Art aficionados and romantics everywhere will surely have their breath taken away when they visit Montreal’s Museum of Fine Arts this winter for its new exhibit, Once Upon a Time… Impressionism. The collection of 95 paintings, which belong to the Sterling and Francine Clark Art institute, features well-known impressionist painters like Édouard Manet, Pierre-Auguste Renoir, Claude Monet, Camille Pissarro, and Edgar Degas. The impressionist movement, named after Monet’s 1872 painting, “Impression, Sunrise”, wasn’t taken very seriously at first; most of the movement’s painters suffered hatred and ridicule from the art critics of the time. Today, they are among the most famous painters to have ever lived and exhibitions of their work never cease to capture the interest of viewers worldwide. This exhibit is organized as a chronological storyline, starting with the precursors of the infamous art movement which features the works of painters like Jacques Rousseau, Jean-Baptiste-Camille Corot and Jean-Francois Millet. Sharing the first room with these paintings is the lovely collection of still-lifes by Alfred Sisley, Renoir, Manet, and one of the few female impressionists, Berthe Morisot. As you walk from room to room, quotes of the infamous and outspoken Renoir line the walls and offer viewers a glimpse into his great mind. “You’ve got to be a fool to want to stop the march of time” is written over the collection of scenic paintings, a testament to the impressionists’ ability to capture time and its beauty. 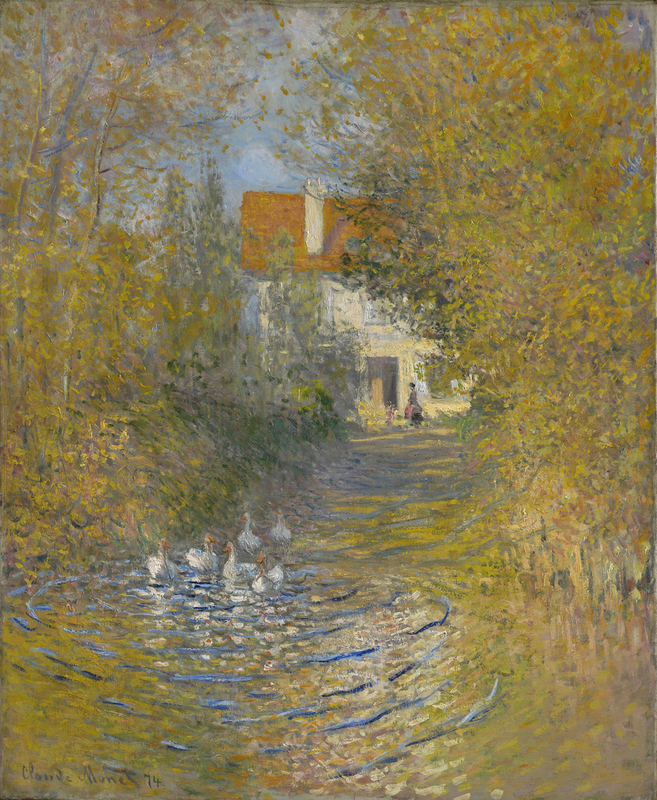 Claude Monet’s “Geese in the Brook” (1874). Oil on canvas. 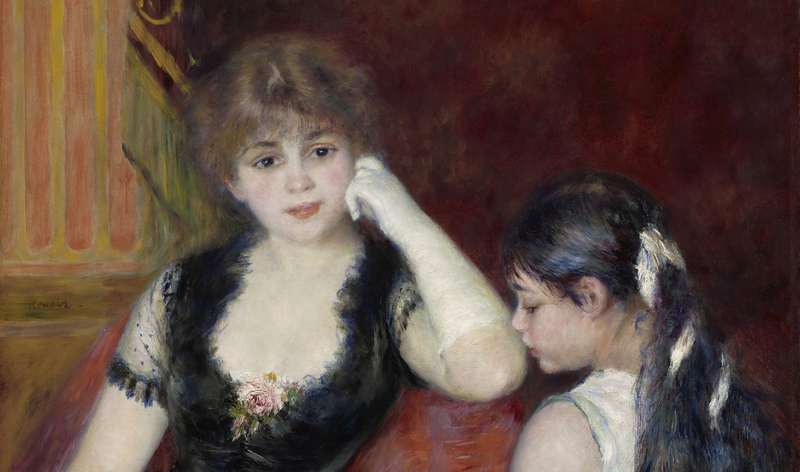 The various “pièces de résistance” of the exhibit lie in the third and penultimate room, which features a vast collection of portraits and self portraits by Renoir, Degas, Morisot and yet another female impressionist painter, Mary Cassatt. Some of this room’s most famous works include Renoir’s “At The Concert,” Degas’s “Dancers in the Classroom” and Morisot’s “The Bath.” The only sculpture to be featured in the exhibit, Degas’s “Little Dancer of Fourteen Years,” captivates museum goers with its stunning simplicity and beauty. The striking contrast between Renoir’s self-portrait of 1875 and 1899 is a reminder of the painter’s mortality. The final room introduces the viewer to the rise of the post-impressionist movement and its painters, like Paul Gauguin and Henri Toulouse-Lautrec, among others. Works like Gauguin’s “Young Christian Girl” and Toulouse-Lautrec’s “Waiting” end the exhibit with a distinct transition into a new era of art. Once Upon a Time…Impressionism runs until Jan. 20.